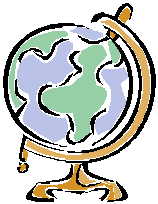 Question: How many points are there on the globe where, by walking one mile south, then one mile east and then one mile north, you would reach the place where you started? Let’s think this through methodically. If we consider the southern hemisphere, there is a ring near the South Pole that has a circumference of one mile. So what if we were standing at any point one mile north of this ring? If we walked one mile south, we would be on the ring. Then one mile east would bring us back to same point on the ring (since it’s circumference is one mile). One mile north from that point would bring us back to the point were we started from. If we count, there would be an infinite number of points north of this one mile ring. So what’s our running total of possible points? We have 1 + infinite points. But we’re not done yet! centered at the South Pole. Walking one mile along these rings would cause us to circle n times and return to the same point as we started. There are infinite possible values for n. Furthermore, there are infinite ways of determining a starting point that is one mile north of these n rings, thus giving us (infinity * infinity) possible points that satisfy the required condition. So the real answer to this question is 1 + infinity * infinity = infinite possible points! Liked this post? Please Digg or Stumble it! Another answer is on the ecuator, +- half a mile on longitude, than the mile is equal on bouth longitude and latitude and you came back where you started. Oh yeah, nicely explained. It is true that there are infinite points where that could be the case. I was glad when I read through your answer because I already knew the answer to this one, and you definitely got it right. But let’s be picky shall we? The problem did state that it was on the globe, so in fact the place at the north pole where this occurs is in fact at the magnetic north pole (which is constantly changing position, and it physically a south pole). Likewise, the ring of infinite positions just over a mile north of the south pole is in fact centered on the magnetic south pole. Which part of the solution don’t you understand? i didnt quite understand this solution. can someone pls xplain it in a simpler manner.